Both are specialist fast bowlers. We are less than 2 months away until the World Cup kicks off. The extravaganza will begin on 30th May 2019 at the exemplary Oval and is likely to be an exciting contest between some of the top cricketing nations. As this much-awaited tournament is about to start in a few days, the enthusiasm has increased not only amongst the aficionados but amongst the teams as well. The cricketing boards from all the 10 countries, who will participate in the upcoming tourney, are busy in selecting squads with full zest and intelligence. One such board of the cricketing fraternity is the Cricket Australia (CA) which has recently announced its 15-man squad. The name of the players, who’ll board the flight to England ahead of the prolific tourney, was announced by CA on Monday morning. The squad consisted of some surprise inclusions like Alex Carey and Josh Behrendorff, whilst inform players like Ashton Turner and Peter Handscomb failed to make the cut to the World Cup 2019. Another exclusion which raised eyebrows of cricket pundits from all over the world was the exclusion of Josh Hazlewood from the squad. Despite fully recovering from injury, the guy wasn’t selected in the team. Kane Richardson also failed to make it to the squad. Howbeit, the Cricket Australia made sure that they don’t let the mindset of the two players go down and put them on standby for the World Cup. After selecting the squad, the head of the national selection panel, Trevor Hohns was asked several questions regarding different aspects of Australia’s plans for the World Cup. 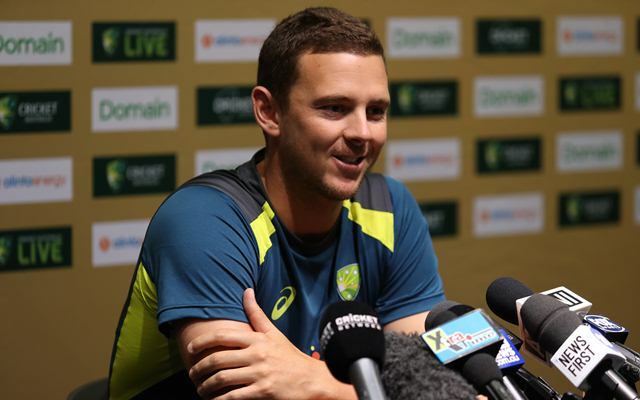 Amidst the conference, a reporter also asked Hohns, the reason behind Josh Hazlewood’s exclusion and what will be his future endeavours. In reply, he said that not choosing the speedster was a difficult choice but his lack of game time eventually resulted in his exclusion. However, in the case of any injury to any of the five fast bowlers, Hazlewood will certainly be called as a replacement. “However in saying that, he still remains an option for us for the World Cup if a replacement were to be required for one of our other fast bowlers. He along with of course Kane Richardson are the standby fast bowlers and we’d have to make a choice at that stage if somebody was required,” he concluded. Get the latest Cricket News and updates from the Indian Premier League (IPL), Match Predictions, Fantasy Cricket Tips and lots more on CricTracker.com.